As a start-up, developing your business plan is no easy task. While you may never have developed a plan before, it's crucial you start now because your business plan will not only guide your actions as you get your business off the ground but will keep your business on track as your business grows. 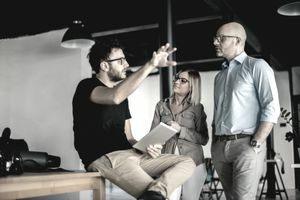 The key components to include in your business plan are a description of your organizational structure (including your management and human resources capabilities) philosophy and needs, the number of employees you intend to hire, how you will manage your employees, and your estimated personnel costs. Begin your plan by outlining your own managerial experience and skills as well as those of your team, the roles of each member of your team, and any particular areas of strength or deficiency in your personnel lineup. Don't worry if you don’t have a complete team in place when you write your plan. Simply use this section to outline the organizational structure along with job descriptions, how you plan to recruit key team members, and what their responsibilities will be. This section should look like a pyramid with you at the top and will likely have lateral positions. Be as specific as possible when defining an employee's responsibilities because this is what will drive your business. Even if you haven't hired an extensive management team, if you expect to hire non-managerial employees (such as salespeople or clerical workers), you should consider recruiting a human resources manager. Pay scale: Clarify the reasonable market salaries for managers and non-managers. Vacation Time: This is not required by law, but most firms offer vacation time to stay competitive and keep employees refreshed. Also, outline how vacation time will accrue as tenure grows because this represents a labor cost. Insurance: Health insurance is a common staple benefit, although skyrocketing prices have forced many firms to cut back on this benefit. If you can’t afford a health plan, look into subsidizing one with employees paying the rest. Alternatively, inquire if a professional insurance representative can help you get a bulk rate. Additional Benefits: Other things to consider including life insurance, a 401(k) and matching funds, bereavement leave, religious and floating holidays, and a potential bonus structure. It may be overwhelming to contemplate these benefits and their costs in the early stages of setting up your business, but in a competitive labor market, your firm needs to offer enough to entice qualified people and, more importantly, to keep them happy.